My mornings begin with Yoga which sets the tone for the day. Every morning is a good morning with a little bit of Yoga thrown in. My anytime, anywhere moments are defined by Shirshasana which instantly recharges my batteries. During a week long trek into the Himalayan Ranges in picturesque Kashmir I was completely in awe of the mighty Harmukh (God’s Face) Peak. 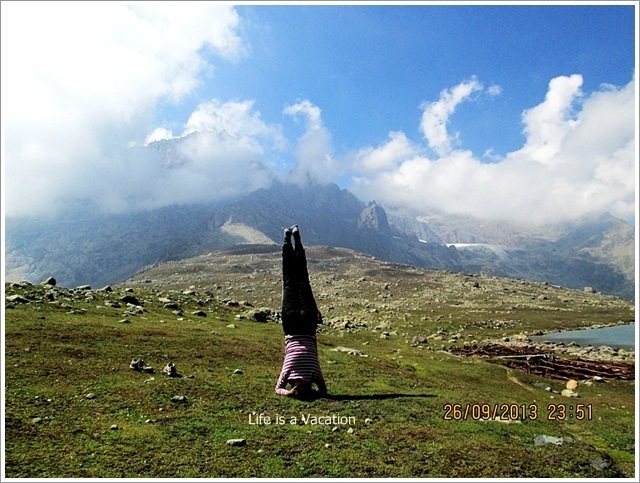 After sprinkling some water on my face from the Holy lake that lies at the feet of the peak, I turned upside down in obeisance, in joy and gratitude. These are rare moments of happiness and my friend very kindly froze the moment through her lens. Impressive! And inspiring! Totally in awe! I wish I could do this too, I know it takes some discipline to achieve this. 🙂 🙂 Took me about 6 months and almost daily attempt at it..
Aha…you usually see and interpret what you are feeling at the moment. The vanity and arrogance must be there somewhere lurking within you 🙂 which made you interpret it that way. Work through it and all asanas whether shoulder, head or hand stand will be a breeze. You can turn upside down!! Incredibly beautiful place. You are so lucky to be there and perform yoga. wow. how long have you been practicing yoga to get there??? I have been practicing for about 4 years and this asana took about 9-12 months to get to the anytime, anywhere mode. You will also get there….its such a warm feeling after that pose, with the blood rushing to the face..
What a view it must have been! I totally in awe that you can do that! So peaceful and I cannot stand on my head ! Wonderful vista to do so. How wonderful this must have felt!